Home sweet home! It has never felt so good to be back in the states! 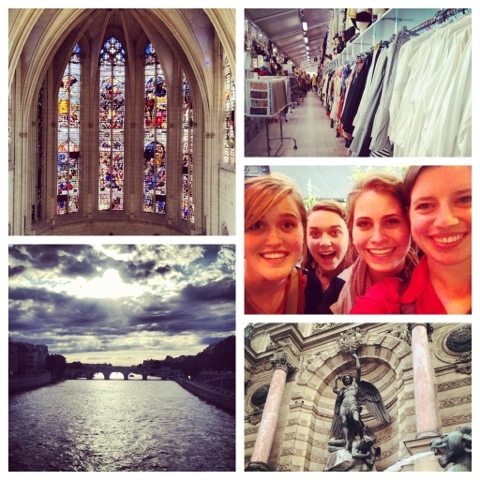 I loved and was so blessed by my time abroad, but three weeks is a long time. It was the perfect amount of time away to enjoy the sights and experience, but long enough to be ready to come home, too. You will probably see many a post about this trip since there is so much to share, but I thought I'd start filling you in today. Same pictures as before, but with a little extra updates. Enjoy! 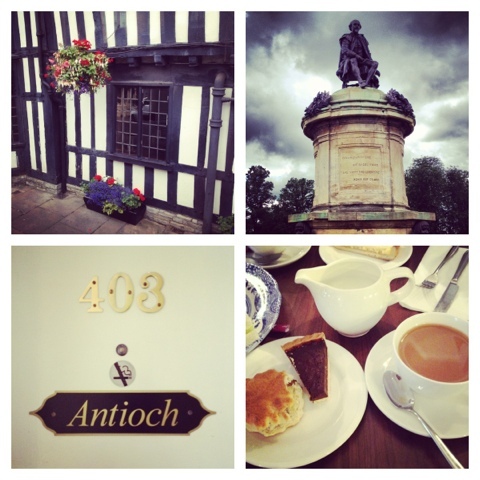 Stratford-Upon-Avon was one of my favorite stops on the trip. I had been one time before and it was pouring rain (this happened everywhere else on this trip, but thankfully not Stratford). The countryside on the coach ride from London to Stratford was gorgeous, and we saw so much of the surrounding area during the 3 days we were there. 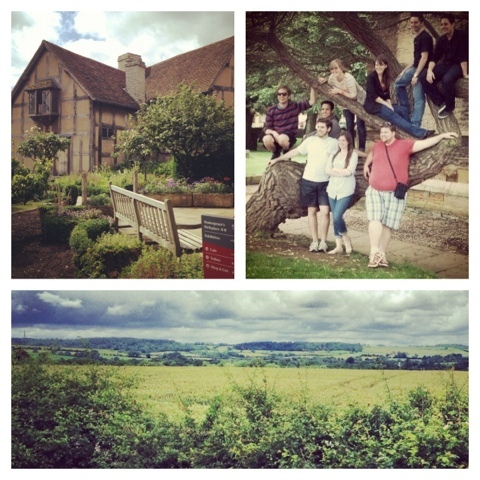 We visited Shakespeare's birthplace and the home of his wife Anne Hathaway (no, not the actress). Some of us even performed monologues from his plays in the courtyard. We toured Trinity Church and stopped to take class pictures. Above are all the seniors on the trip: Jimi, Cisco, Kelsey, Kim, Jason, Michael, Brian, me, and Zach. 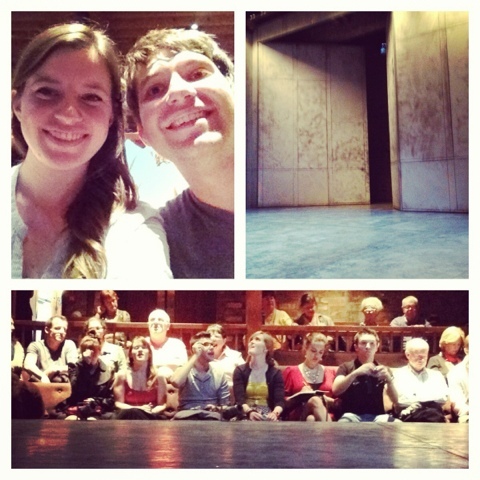 We saw two shows at the Royal Shakespeare Company. Zach has been my seat buddy for most of the trip, together on the plane, at shows, and boat rides. For Richard III we had front row seats on either side of the stage. It was incredible! One of the most brilliant productions I've seen (a close second to the version of Henry V we watched at the Globe in London). We jokingly called our seats the splash zone because the actors were spitting so much when they talked, and we were dangerously close to the sword fight at the end. It was still a phenomenal production, even though Richard's sword broke at the hilt moments before the epic final fight was to take place. We were quite proud of how they improvised and made it work! Only theatre majors would notice the mistake and we were all anxious to talk to them about it after the show. Our third day in Stratford we took a day-trip to Oxford. This was the worst rain we had seen so far on the trip. Our plan to bike around the city was swiftly cancelled and we hid out in a spiffy restaurant before it opened to dry off and wait out the rain. The place had free WiFi which was hard to come by on our travels, so we all whipped out our phones and soaked up as much as possible. Brian perched himself in an armchair and looked rather miserable. It was too funny. After lunch, Oxford brightened up quite a bit. We took a nice walk around the town and spotted several locations used to film scenes in Harry Potter. 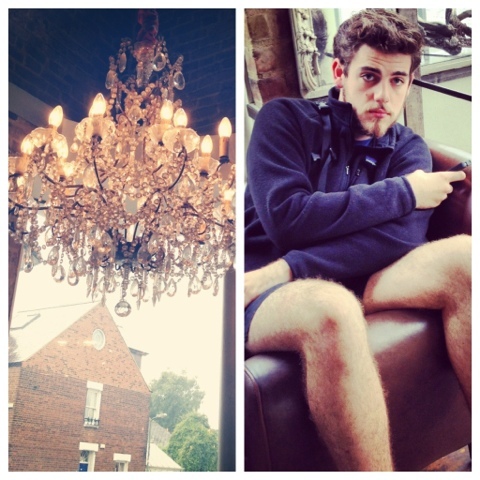 Our plan to visit the Warner Bro's studios in London didn't work out so these sightings had to tide us over. We did not stay in Oxford too long but it was enjoyable just the same. The next day we were off to Paris! It was 2 hours back to London and 2 hours on the Eurostar through the Chunnel and voila! Hello, France! We would be staying in France for 8 days, the longest stop on the trip, and our schedule was much more relaxed. We had museums to see in the mornings and our afternoons and evenings were free save the nights we had shows to see. We were there on Bastille Day which was exciting and we were able to see fireworks off the Eiffel Tower. We also saw The Amazing Spiderman in imax and 3D one day when it was raining (so much rain!) and it was so interesting to watch it dubbed over in French! Courtney and I had already seen it at the midnight premier in the states so we understood well enough. 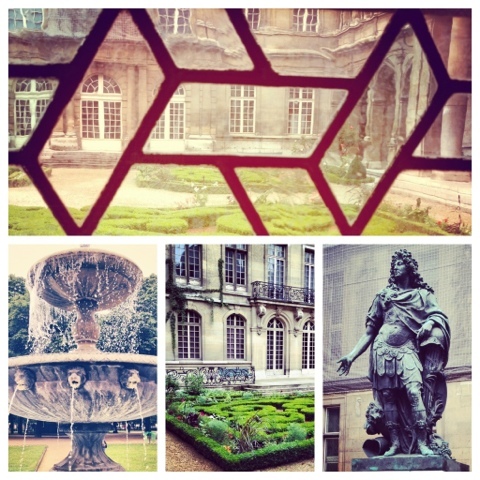 We visited the Musee Carnavalet and Victor Hugo's house on our second day and it was in a really nice part of town. We had lunch at a nifty cafe and they were none too pleased when we all ordered the cheapest meal on the menu, jambon and fromage baguettes (ham and cheese sandwiches on french bread). In France, there seemed to be no such thing as split checks so it was always an ordeal when it came time to pay. Everyone putting in their part and one or two of the group trying to tally it up and make change. Brian got out his camera to try to take a picture and ended up knocking over his water glass. It crashed onto the table and broke, then fell to the floor and shattered even more. We were very thankful to bolt after that. 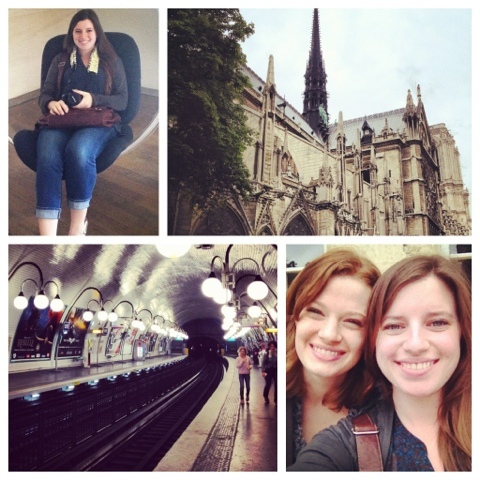 During our stay in Paris, we went to the Rodin Museum and toured Notre Dame. It took us no time at all to learn the Metro, which was very similar to the London Underground (now the Brussels' system... oh so different). We visited the textile museum and a few others (they all tend to blur together after three weeks) and in one there was a huge exhibition on Louis Vuitton and Marc Jacobs. I had no idea the history behind it. 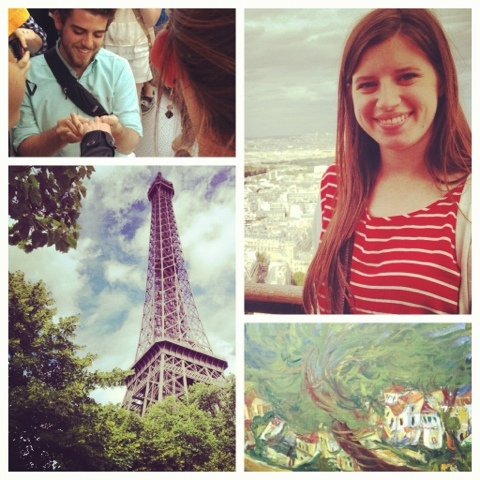 Probably one of the most exciting things during the trip was celebrating my 21st birthday in Paris! 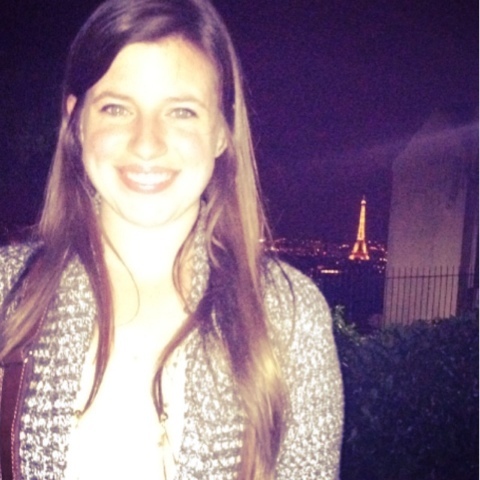 We headed out to the steps of Sacre Coeur at midnight and had a wonderful time. My group sang happy birthday to me several times (it was really quite beautiful with all these talented singers in our department!) and I was serenaded by a man in complete Japanese warrior (?) garb. It sounded more like "Happy Bahhhhhsday, Payway" than "Happy Birthday, Bailey," but I didn't mind. You could see all of Paris from up there and we drank in the view of the Eiffel Tower. It was quite magical. 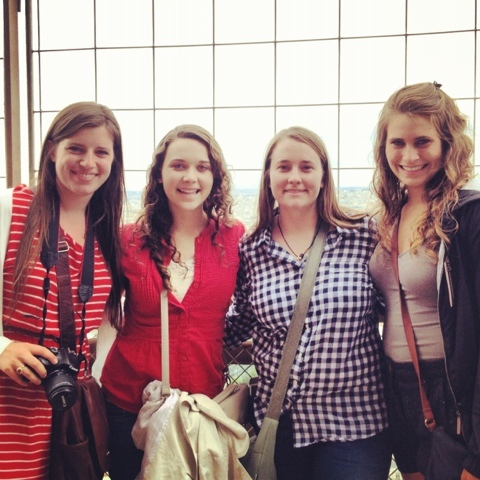 The next day after touring The Louvre, we climbed the Eiffel Tower. The line for the elevator was hours long, so what did we do? Volunteered to take the stairs, that's what. Stairs?! Yes, ma'am. 700 of them to the second level. 700! It was quite the treck. From there we took the elevator all the way to the top. I am rather afraid of heights so this was definitely out of my comfort zone, but when else could I spend my 21st birthday on the top of the Eiffel Tower? Never! At the top, Brian mock proposed to Kim. We all knew it was coming but we thought he was going to do it to Courtney or Kelsey. False! He turned to Kim, surrounded by other tourists, and got down on one knee. She was completely taken by surprise and reacted perfectly! She was laughing and crying and flustered and it seemed completely real. The people around us were thrilled and started taking pictures. One of the most hilarious and memorable moments! Kelsey and I were roommates during the entire trip and we both shared a passion for our Canon Rebels. While I took a break after our adventure up the stairs, I caught a shot of her at work. Such an amazing friend she is! A true joy to have around. She kept a quote book on her phone during the trip, and I must say she captured some gems. 100+ for sure. Maybe I'll get a few of those up at some point, but they were mostly you-had-to-be-there moments. Our favorite part of Paris ended up being St. Michel. The day before my birthday we visited a beautiful chateau then decided to take the Metro, get off at a random stop, and eat wherever we ended up. Once out into the light we turned to our left and found Le Sarah Bernhardt! A cute little cafe dedicated to a French actress we studied in theatre history! We knew we had to eat there :) We all splurged on lunch (steak and fries and diet coke) before wandering around the neighborhood. 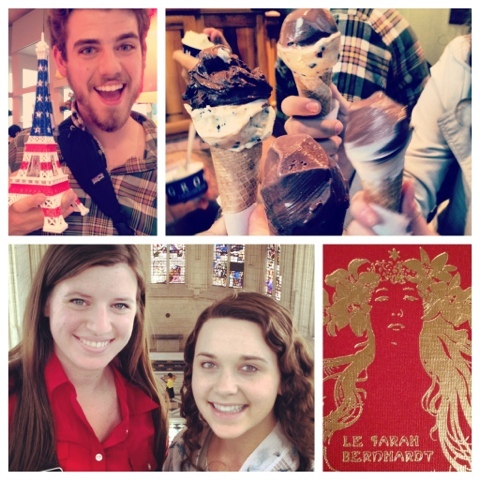 It ended up being the night of gelato hopping. We were on the hunt for one specific place and ran into another on the way. Chocolate gelato in hand, we decided on a whim to keep on to the one we originally searched for and have gelato TWICE in a row. You only live once? Nah. You only study abroad once. That was our motto. 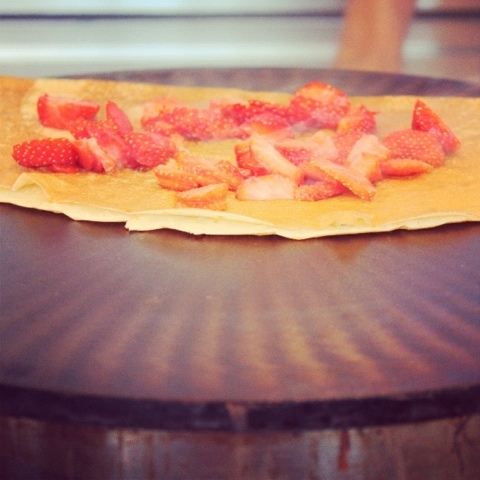 Crepes became part of our daily routine. We had a favorite crepe and baguette stand near the hotel where we would have Nutella crepes on the way back in, but all week I had been on the hunt for a place that sold Nutella and strawberry crepes. Guess where I finally found one? St. Michel! It was divine! I will never look at pancakes the same again and Nutella has become a new favorite. 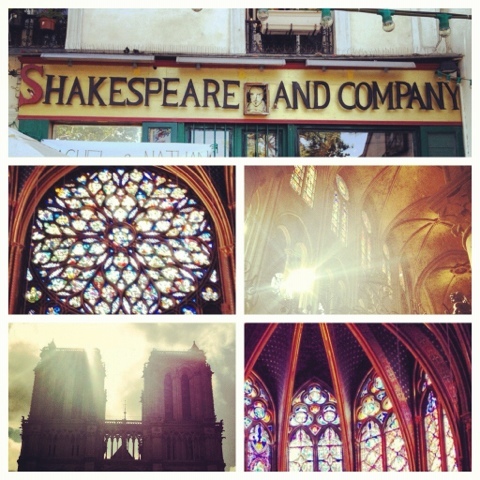 Just across the street from the Notre Dame was the famous Shakespeare and Company book shoppe. It has so much personality and is absolutely adorable. I bought a copy of Pride and Prejudice with a beautiful cover by Penguin Books. It was a splurge, but totally worth it. We visited La Chapelle that day as well which was full of incredible stained glass depicting every story in the Bible. It was under some construction so one wall was entirely blocked off, but it was beautiful none the less. 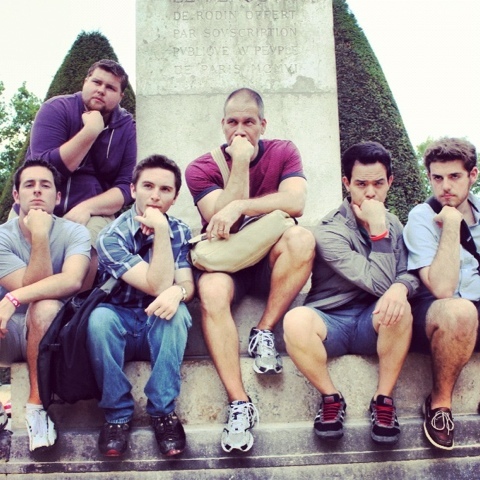 Here is "Team Stan" in front of The Thinker at the Rodin museum. The boys from left to right are Zach, Jason, Michael, Stan, Cisco, and Brian. All seniors plus the head of our department. Perhaps my favorite jewel of our time in Paris was the trip to Versailles. The palace was gorgeous but I fell in love with Marie Antoinette's hamlet. 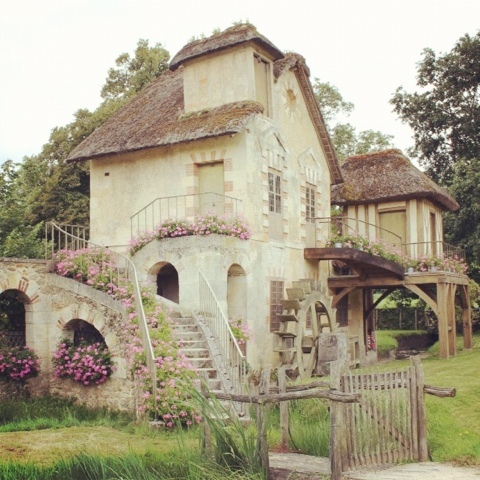 The way our professors described it was as if Marie Antoinette wanted to be able to pretend to be a peasant then had Disney design her cottage. It was so picturesque and beautiful! Surrounded by gardens and lakes. I would absolutely live there if I could! I felt like Belle from Beauty and the Beast and was in heaven while wandering the grounds. We spent at least six hours at Versailles and I could have stayed there so much longer. Simply gorgeous! Oh, I could go on and on about this trip and I probably will, but I think I need to get on with the day. I hope you all had a wonderful past few weeks! I'm eager to get back in the swing of things and don't worry, you'll be hearing from me far more often. Oh my, so many great photos. I love them all (even pinned one of them). Looks like you had an amazing time! Thank you, Silver! I hope your summer's going well! Beautiful photos!! It looks like you are having an amazing time! It was absolutely fabulous. Thanks, Katie! 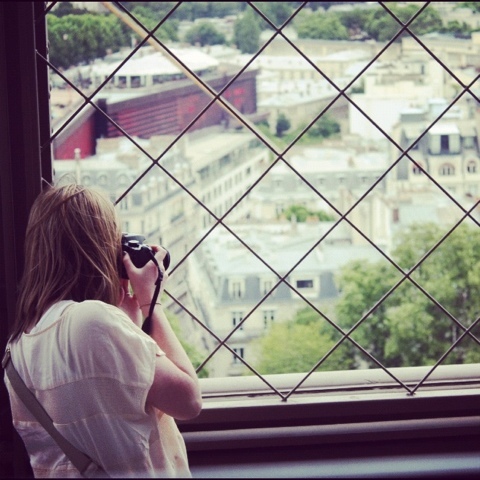 I am in love with looking at your Europe photos! Thanks, Jess! I'm so thankful to have them. I'll want to remember this trip forever! wow this trip looks amazing. i have never been to europe. someday. there are some cutie pies on that trip with you! You absolutely have to go if you get the chance :) Thanks! wow those are incredible photos! what an amazing trip you experienced! I'm so envious. reading about your travels makes me anxious to go right now!! but I don't think my littlest one year old would really be into traveling that extensively. maybe in a few years ;) it's nice to meet you. 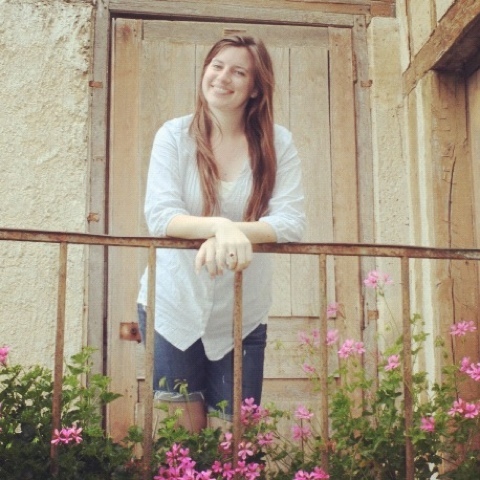 I found you on Casey's blog. You must go! Absolutely! But I understand with the little ones :) Someday, for sure. 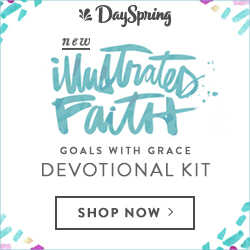 I'm glad you stumbled upon my blog! Welcome! Oh my goodness, how fun! 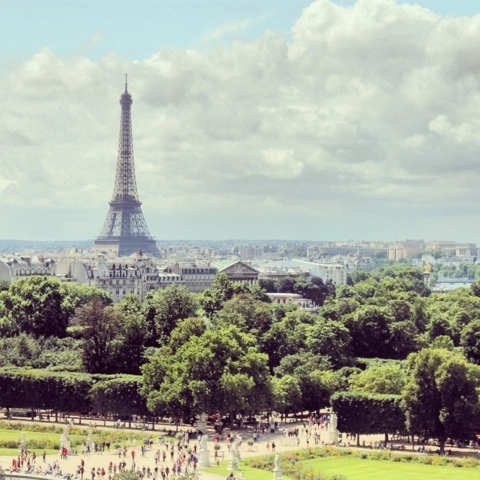 Your photos bring back sweet memories of London and Paris from last summer. I think we were in Paris almost the same time! I was there from July 7-14. I loved Versailles too, but I didn't have enough time to see Marie ANtoinette's cottage. 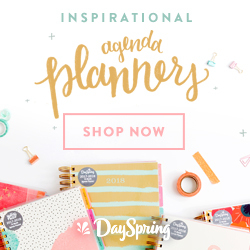 It is on my to-do list for this summer!! 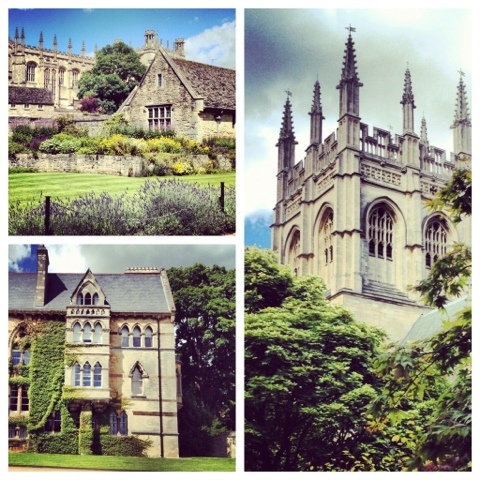 I also loved Oxford! I did not go to Stratford-Upon-Avon but I went to two other villages in the Cotswolds . .. . SO beautiful and dreamy! !